March for Babies is coming. 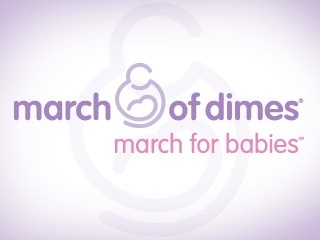 Ten days until the March of Dimes Walk. For those of you who did not know, Shawn and I decided to walk this year to celebrate the in memory of Mary and Christopher. We’ll be walking with our family and friends as “Team Colley” at the Columbus March of Dimes March for Babies on May 1st. We wanted to do something to honor them that would be joyful and and also help a great cause. I am hoping that this will become a tradition that we can continue. I’d like to thank all of those who have already generously donated to our team’s fundraising goal and invite those of you that are interested to support our team either by walking with us or by making a donation on our team page. Thanks everyone for your love and support.